What is your policy on shipping large items like furniture? What are the measurements of the t-shirts? Can I get a t-shirt with a chocolate or yellow dog? Or can I change the color of the t-shirt? Can I change the color of the Lab in the print I want to order? What is a Dog Party and when are they? Where would you recommend I stay with my dog when I visit? How do I get to Dog Mountain? When are the Gallery and Dog Chapel open? How can I lend my support Dog Mountain? How do I get the latest news from Dog Mountain? Q: What is a woodcut print? Stephen Huneck spent his days in his light-filled studio in St. Johnsbury, Vermont. To create a woodcut print, Stephen would first draw the design in crayon, laying out the prospective shapes and colors. He then took a wooden board and carved away all areas that were not to be printed. The result was a series of carved blocks, one for each color in the print. One wall of his studio was completely covered with the collection of chisels that Stephen used to hand-carve each block of wood for his wood-cut prints. After a block had been inked with its respective color, acid-free, archival paper was laid onto the block and it was hand-pulled through our press at Dog Mountain. The finished woodcut print is a unique piece of fine art, each one slightly different from the rest. In other words: All woodcuts are originals. Woodcuts are limited edition numbered prints made during the artist's lifetime, under his supervision. Each print will come with an embossed certificate of authenticity. Most woodcut prints are offered with black, yellow or chocolate Labs. Each print is available either unframed or framed in acid-free mats and a black painted frame. A: Giclee (pronounced "jhee-clay") is a French term meaning the "spraying of ink". It describes a technologically advanced way of producing fine art. To make a giclee, we begin with an original artist's proof of the woodcut. We then take a high resolution image of the woodcut. Giclee printing is a digital process and it requires several steps to get from the original art to the print. The first step is to capture the original by the use of a high quality digital camera. Next, the digitized image is loaded into a special computer program and color corrected to ensure that the colors match the originals. This color matching requires a high level of skill. Our fine art giclees are printed on 100% cotton rag acid-free fine art paper using archival pigment-based inks. The ultra-fine density of the ink droplets allow for superior saturation, dynamic color, and thorough penetration into the surface. This assures a quality print with a long life. The inks are carefully matched to be compatible with the paper on which they are printed. Finally we reproduce the artwork using a sophisticated printer that is specifically designed to offer a greater resolution than achievable by normal printers. The ink and paper, both used in printing a giclee, are archival and will last for 200 years before any fading will occur. Giclees are the finest method of art reproduction available today. While the small giclees are an unlimited production, only 500 of each large giclee are printed. The Stephen Huneck Gallery currently offers two sizes of giclees that come either unframed or framed. 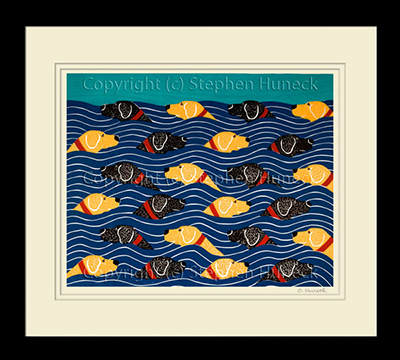 Stephen's signature is included on all giclee prints. A: Lithography is the least manually-intensive reproduction technique and, as a result, a lithograph usually is less expensive than a serigraph (silk-screen) or giclee. Our lithograph images have a high resolution and excellent appearance, but they may not have the same degree of resolution or color density as a serigraph or giclee. Lithographs exposed to direct sunlight may fade over time. Lithography uses a printing technique originally based on the principle that oil and water do not mix (Wikipedia). Using oil-based ink or a grease crayon, an image is drawn on a flat stone or metal plate. Water is applied to the surface and is repelled by the areas where oil-based images have been drawn. The entire surface is then coated with an oil-based ink that adheres only to the areas drawn in oil, ink or crayon. The image is then printed on paper. Lithography became a popular printing technique because thousands of exact replicas could be made that were like drawings on paper, without degradation of the image. Q: How are prints framed? A: You can have your Stephen Huneck giclee print or original woodcut print professionally framed by our Dog Mountain craftspeople. First, we double mat your print in the highest quality, acid-free mat board, and then we frame it with a flat, wood composite frame that is painted black. Each frame measures 1 1/2” wide and 3/4” thick. We use the highest quality conservation UV filtering glass to protect your print from UV damage. Diptychs and triptychs are framed in separate frames. That is, the two images comprising a diptych are framed separately, as are the three images that make up a triptych. A: Dog Mountain wants you to be 100% satisfied with your purchase. We will gladly accept the return of new, unused, and undamaged merchandise within 60 days of purchase. Returned merchandise must be in its original condition and accompanied by a receipt or proof of purchase. Shipping and handling fees are not refundable. If the items were shipped under a free shipping promotion, our shipping and handling cost will be deducted from the refund. Refunds are given as store credit. Upon request, returns can instead be refunded back to the original method of payment. Custom orders that include personalized text are non-refundable. All framed art is subject to a 15% restocking fee. Q: What is your policy on shipping large items like furniture? A: We are currently not equipped at Dog Mountain to handle the packing and shipping of large items such as furniture. For that reason, all final packing and shipping arrangements and costs are the responsibility of the buyer. Also, please note that items not purchased directly through the website, including furniture, do not qualify for our free shipping deal for online purchases. We are happy to provide recommendations and quotes from shippers. We will also help coordinate all arrangements with them and provide each party with all necessary instructions, addresses, and contact information. Arrangements to pay for their services are made directly between buyer and shipper. Should you wish to contact a shipper directly to arrange packing and shipping, we recommend contacting us to obtain weight and measurements, as well as other pertinent information. These shippers provide a white glove service. They pick-up, blanket wrap, and set up in your home. Plycon Transportation Group (https://www.plycongroup.com/): 631-269-7000. Of course, if you live in the area, you are always welcome to come pick your items up at the gallery. Q: What are the measurements of the t-shirts? Q: Can I get a t-shirt with a chocolate or yellow dog? Or can I change the color of the t-shirt? A: The Lab depicted on our t-shirts comes only as a black dog (unless the t-shirt has two dogs on it already: Networking, Love is Give and Take). They only come on the color t-shirt as shown. Q: Can I change the color of the Lab in the print I want to order? A: Yes! Most prints that depict Labs can come as a black, chocolate or yellow. There is a color drop-down option on the product pages for the prints that allow color selection. Q: What is a Dog Party and when are they? A: Three words: So! Much! Fun! A few times a year we throw a party for four- and two-legged friends alike. Expect grilled hot dogs and a snack spread, dog contests, and lots of tail wagging and bum sniffing. Usually held on Saturdays, we start around noon and go until 4pm. Watch the News From Dog Mountain and the Events Page on this website for announcements. Better yet, subscribe to our newsletter! Click here for a slideshow of Dog Party images. Q: Where would you recommend I stay with my dog when I visit? A: We have a wonderful list of pet-friendly accommodations here. Q: How do I get to Dog Mountain? Q: When are the Gallery and Dog Chapel open? A: Dog Mountain and The Dog Chapel are open every day from dawn until dusk. The hours for the Stephen Huneck Gallery change seasonally and can be found here. Q: How can I lend my support to Dog Mountain? A: Dog Mountain is a certified 501(c)(3) non-profit organization. If you would like to give your support to Dog Mountain, please consider making a tax-deductible donation online or signing up to volunteer. Thank you for your support. Dog Mountain forever! Q: How do I get the latest news from Dog Mountain? A: Subscribe to our newsletter to stay up to date about the latest news, events, products, and promos. If your question was not answered, please call the gallery at 800-449-2580 and ask us. We'll have an answer for you!